Indianapolis, IN (December 2016) – The IUPUI Office of Orientation Services in the Division of Undergraduate Education has been awarded the Outstanding Non-Print Media or Emerging Technologies Award from the National Orientation Directors Association (NODA) during its annual conference November 5-8, 2016. The winning entry is a three-part video that was shown at the beginning of every 2016 summer orientation welcome session to the campus. It highlights the transition to campus, campus life, the importance of getting involved, making the most of one’s college experience, important campus initiatives, and the availability of the orientation teams (OTEAM) to help with integration to IUPUI at any level. It also showcases current student leaders in OTEAM and what they have accomplished and why they love IUPUI. After each video segment presentation, orientation leaders conducted conversations with both students and their guests that were directly related to the content of each video. The Outstanding Non-Print Media or Emerging Technologies Award is one of five award categories in NODA’s Publications & Media Showcase awards which highlight the best of promotional materials submitted by higher education institutions across the United States and internationally. 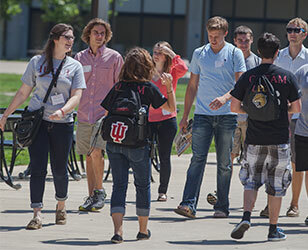 To view the winning videos or to learn more about the IUPUI summer orientation welcome program, please contact Stephanie Keiner, director of the IUPUI Office of Orientation Services, at sdosborn@iupui.edu.